The HyperX Cloud Stinger Core is the perfect entry-level headset for the console gamer looking for great sound at a great price. 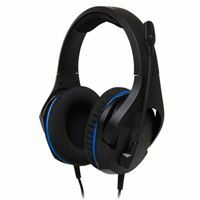 It;s multi-console compatible and features audio controls on the cable. An adjustable steel slider and soft ear cushions provide comfort, and the flexible swivelling mic lets you position the microphone where you want it. Cloud Stinger Core's direcitonal 40mm drivers keep you immersed, and it;s backed by a 2-year warranty and free tech support.